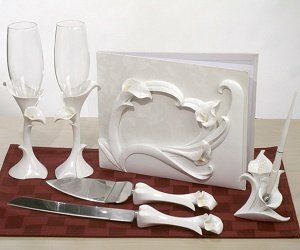 This gorgeous white calla lily wedding set includes themed accessories for the reception including a pair of toasting glasses, a guestbook with matching pen set, and a cake knife and server set. 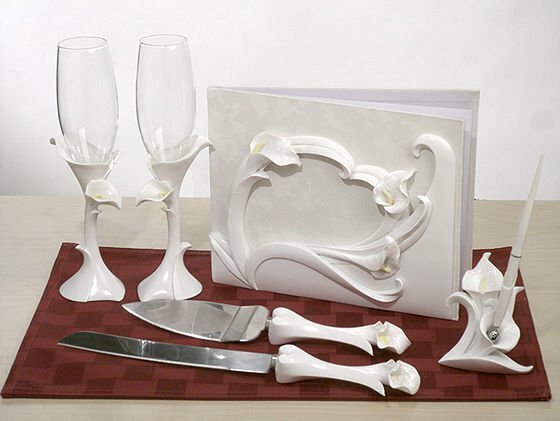 The 10" tall calla lily toasting glasses arrive in their own gift box as a set. The stainless steel cake knife and server set arrive in their own box as well. They feature resin handles with a calla lily design. The knife is 12.5" long while the server is 10.5" in length. The beautiful calla lily guest book measures 8" x 10" and finally, the pen and calla lily design stand measure about 8" tall.